“A little rain, a little wind doesn’t hurt people out here. A nor’easter … a severed power line, we can deal with. A hurricane, how to move a historic lighthouse, all of those things the people here do with determination and gusto. 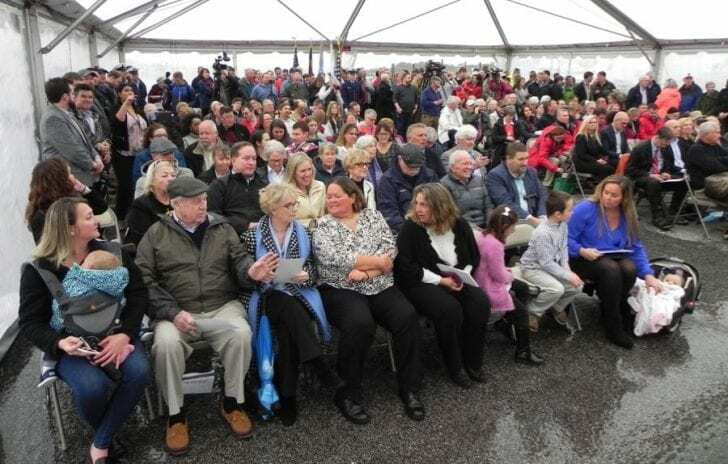 The $254 million bridge, designed to stand for 100 years, opened to traffic in February, and a community celebration was held before that, so the ribbon-cutting at the Oregon Inlet Fishing Center seemed somewhat anticlimactic. 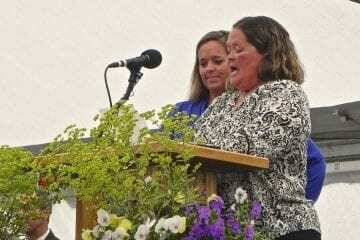 Much of the hour-long ceremony was devoted, instead, to heralding Basnight’s contributions to the Outer Banks and his deep Dare County family roots. 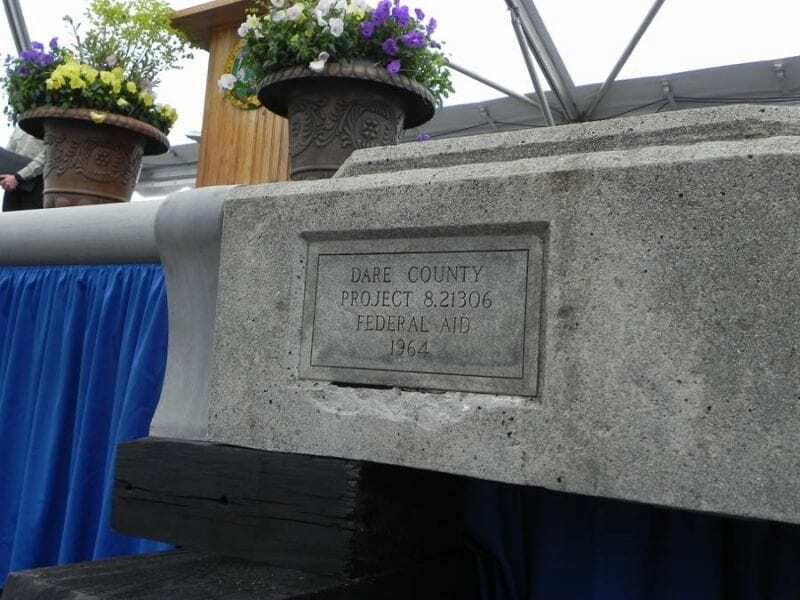 A piece of the railing from the Bonner Bridge with its opening date. Basnight was recently honored by the state Board of Transportation when they named the new bridge for him. The 26-year legislator and longest-serving state Senate president pro tem has been in poor health since his resignation in 2011 and could not attend. But his family was well-represented in several front rows at the event. They included his daughters, Vicki and Caroline, who took the stage to read a message in their father’s handwriting. In front of them was a piece of railing from the Herbert C. Bonner Bridge with the date of its dedication, 1964, etched in concrete. Construction began on the bridge in March of 2016 after nearly 30 years of planning, environmental reviews and legal battles. The new bridge is 2.8 miles long and rises 90 feet above Oregon Inlet at its highest point, with 8-foot shoulders on each side. It is the first bridge in the state built with stainless reinforcing steel, which will provide extra protection against the salt-water environment. The new bridge replaces the Herbert C. Bonner Bridge, which was built in 1963. Demolition of the old bridge has started and is scheduled to be complete by the end of the year. A 1,000-foot section of the south end of the old bridge will remain as a pedestrian walkway and retain the name. I am wondering how many people from Hatteras island attended today’s ‘celebration’ ? Over 3000 signatures were very much opposed to the bridge changing its name, it was a back room deal that happens too much in Dare county. We will always call it Bonner bridge. Most people here won’t call it the Basnight bridge. If some out of towner asks me how to get to Oregon Inlet or Avon, Buxton, Hatteras, etc, I’ll tell them to go to the Oregon Inlet bridge and they’ll be on their way. The petition you are speaking of had 3000 signatures, only 247 of these had local address. The county’s poll had 308 votes for Basnight, and yesterday had an estimated 300 attendees, many of which were residents of Hatteras Island. Furthermore, the county board of commissioners asked for public input with the county poll. Again, for your information, they did not need or have to do so. They did this out of respect to the citizens of Dare County. I’m pretty sure you could walk around Dare County, especially Hatteras, handing out $10 bills and people would complain they weren’t twenty’s. The bridge benefits Hatteras residents, but it isn’t theirs as some would have us believe. It belongs to the people of NC. There was a naming process, not a back room deal, it is finished, let’s please move on and enjoy the new amazing bridge. I think the new Oregon Inlet bridge is a wonderful engineering marvel and very safe to drive on. Glad it is finally finished.